Galveston Island State Park is a paradise located on the west end of Galveston Island. The park is within the Galveston city limits and in Galveston County. The park is composed of 2,013.1 beautiful acres overlooking both beach and bayside terrain. According to the Texas Parks and Wildlife Department (TPWD), the site was acquired in 1969 from private owners under the State Parks Bond Program and was opened to the public in 1975. Galveston Island State Park offers camping, birding, nature study, hiking, biking, fishing, and beach swimming in the Gulf of Mexico. Educational tours of the flora and fauna of the beach and bay area within the park are available by appointment only. Contact the park for more information. Although the park received significant damage from Hurricane Ike, beach and bayside camping sites are open, as well as the Beachside Day Use Area, which has tables, grills, and rinse off showers. Restrooms and showers are available on the beach side and restrooms without showers are available on the bay side. Wildlife viewing opportunities won’t disappoint on the island. Wading and shore birds, mottled and mallard ducks, raccoons, armadillos, and marsh rabbits are plentiful in the park. Beach and surf fishing will produce spotted seatrout, sandtrout, black drum, croaker, and flounder, among other sea life. Elevation: 1 Ft. above sea level. Weather: January average is 46.2, July average is 85.9. First/last freeze: November 20/March 11. Schedule: Open 7 days a week year-round, except for hurricane watch/warnings. Busy Season: March through October, especially weekends. Directions: The park can be reached from Interstate 45 by exiting right onto 61st Street and traveling south on 61st Street to its intersection with Seawall Boulevard and then right (west) on Seawall (FM 3005) 10 miles to the park entrance. Applicable daily entrance fees are charged in addition to the campsite or facility fee. Pets are not allowed in any Texas State Park buildings. For other general pet restrictions check the Texas State Park Regulations. For park specific pet restrictions and more information call the park at 1-800-792-1112. Maximum 8 people per campsite unless otherwise noted. Applicable daily entrance fees are charged in addition to the campsite or facility fee. March – October occupancy is limited to 14 days within a 28 day period. 10 – Bay Side campsites with water – These sites are reservable. National Weather Service forecast for this area. Galveston Island, Texas- For over two decades teams of architects, designers, and engineers have taken their tools to East Beach in Galveston for one of the world’s largest sand castle competitions. 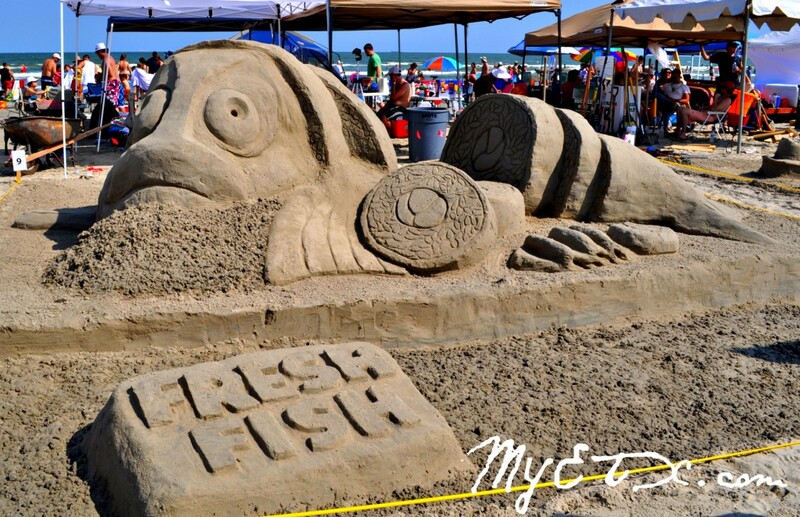 This weekend gigantic sandcastles will decorate the shore of Galveston’s East Beach. This Saturday, May 31, the island will host the 28th annual American Institute of Architects (AIA) Sandcastle Competition.